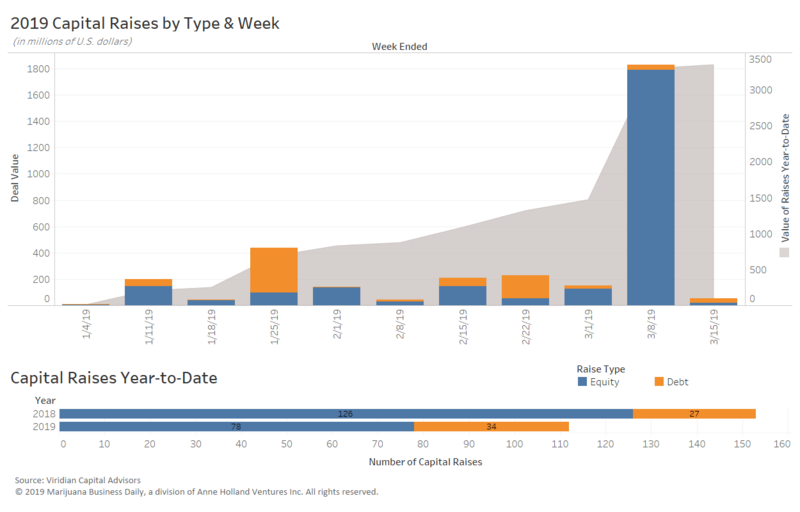 Through the first two weeks of March, cultivation and retail continued to be the most attractive for capital raises, with the sector raising more than $2.7 billion during that period compared with $1.38 billion in the same period last year. 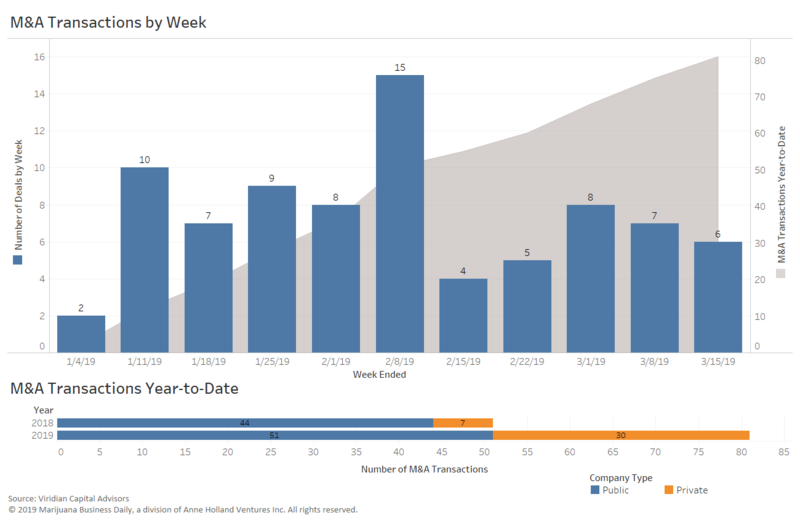 Each week, Marijuana Business Daily and Viridian Capital Advisors provide the latest data on cannabis investment activity and M&A, along with key takeaways, analysis and trends based on recent market moves. The data below, provided by Viridian, is through the week ended March 15. Green Peak Innovations, a medical cannabis cultivator based in Lansing, Michigan, raised more than $30 million in an oversubscribed debt round. The funds will be used to support Green Peak’s expansion in its home state as well as plans to take the company’s “scalable model to other states,” CEO Jeff Radway said. The company also has plans to expand its Windsor, Michigan, headquarters by up to twice its existing capacity of 60,000 square feet. Toronto-based World Class Extractions, a privately owned cannabis extracts processing company, closed on a 22.8 million Canadian dollar ($17.1 million) private equity placement. Aleafia Health (TSX: ALEF) closed its CA$173 million acquisition of Ontario-based cannabis producer Emblem, heralding further consolidation in the Canadian marijuana industry. Texas-based Golden Developing Solutions (OTC: DVLP) closed its acquisition of CBD producer InfusionZ. Golden Developing CEO Stavros Triant told Marijuana Business Daily the deal was valued at roughly $5 million.